The Trapp family of New Westminster, British Columbia knew the feeling of loss better than most. Four Trapp sons went off to the First World War and only one returned. Such terrible loss speaks to us when we look back at the war, but we should not give Kipling the last word. 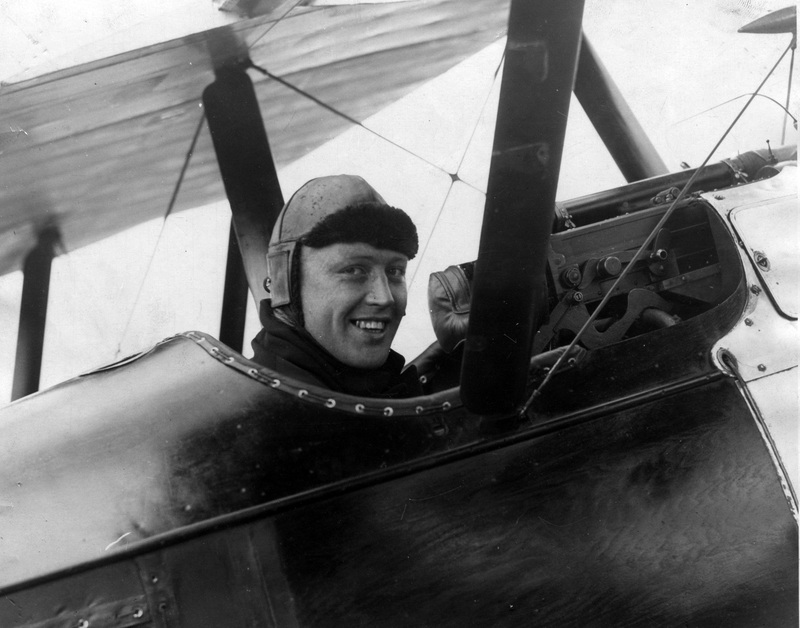 In some cases comfort could be found, and for the Trapp family it came from Raymond Collishaw, one of the great aces over the Western Front, and a fellow British Columbian. Raymond Collishaw, 1918. All images from the Raymond Collishaw Fonds, Library and Archives Canada, MG 30-E280, R2492-0-5-E.
From Nanaimo, Collishaw, joined the Royal Naval Air Service (RNAS) in 1915 and served as a scout (fighter) pilot on the Western Front throughout the war. At a time when the life expectancy of the average British pilot was just 18 days, Collishaw defied the odds. Over the course of two years of operational flying with six squadrons he was credited with 61 confirmed kills, making him the second leading British Empire ace behind fellow Canadian, William Avery “Billy” Bishop. His success and longevity marked him as a competent commander and he was progressively promoted throughout the war. He commanded No. 3 Naval / No. 203 Royal Air Force (RAF) Squadron from January 1918 through the end of the fighting in November 1918. Following the end of hostilities, Collishaw opted to remain in uniform and fought in a number of small wars in the Middle East. One of his letters to Caroline Breadner, a woman he considered “my second mother” revealed the difficulties of serving away for home for so long. Collishaw’s letter starts off very upbeat describing his experiences in Persia in the fall of 1920 and the winter of 1921 when the terrible weather and remote, difficult terrain were as much an enemy as the Bolsheviks they were fighting. Mesopotamia, or Mespot as it was called by British servicemen, primarily encompassed the area of the Tigris and Euphrates Rivers in what is now the modern state of Iraq. This area, formerly part of the Ottoman Empire, was a British mandate in the aftermath of the First World War. By May 1920 Britain had committed over 133,000 troops and four understrength RAF squadrons to the region to deal with a succession of small scale tribal clashes, insurrections and raids which threatened to explode into a general revolt. Collishaw in the early 1920s, when he was based in Baghdad. With the mails just in to-day mother wrote about the death of my beloved youngster brother Clyde of pneumonia on the 28th of December last. Of course, I am astounded and it all seems a bad dream. It seems cruel to have the knowledge only after four and a half months. Clyde was a good lad and I bitterly regret his death. You may have heard me mention him to you as having been a midshipman in the navy. Mother is filled with grief and mourns his loss especially as she had reared him safely almost to manhood. Anyway, I am glad to remember as a brother that I knew Clyde to be innocent of shame and so can meet his God with a comparatively clear conscience. A letter home, the typical duty of a commander in war, would have been sufficient, but it says much about Collishaw’s character that he took the time to visit these families personally to express his condolences and share their pain. Collishaw’s visits may have been part of his grieving process, but he clearly intended them to benefit families in some small way. Perhaps they demonstrated to the families how important their sons were and brought them comfort. During his leave in the late summer and early fall of 1917 Collishaw made his way from France to his home on Vancouver Island. Along the way he stopped in New Westminster, BC to pay his respects to the Trapp family. Thomas John Trapp and his wife Nell had a large family of eight children – four boys and four girls. All four sons were military aged during the First World War and enlisted for service. The oldest boy, Thomas, joined the 131st Battalion CEF and would eventually find his way to the Western Front where he was severely wounded and invalided home. The three younger sons would join the British flying services. George Trapp was a squadron mate and good friend of Collishaw’s in No. 10 Squadron, Royal Naval Air Service. The experienced Collishaw had taken George under his wing when he joined No. 10 Naval. George’s older brother, Stanley, also an RNAS pilot, was killed in December 1916, bringing Collishaw to the Trapp home during his leave many months later. During this visit Collishaw met George’s sister, Juanita (Nieta), and they soon became friends. Collishaw recalled, “While visiting the family I met the two sisters, both lovely girls, and I was immediately taken by one of them, Neita. I returned to New Westminster during my leave and before I left for overseas we had become engaged.” Some good had emerged from the loss of Stanley. Unfortunately, tragedy was not yet finished with the Trapp family. George was killed in action while Collishaw was on leave in Canada. The youngest brother, Donovan, left the University of British Columbia and served as an engineer with First Canadian Division in France. Yearning to follow his brothers, he transferred the Royal Flying Corps and qualified as a pilot. He joined the illustrious No. 85 Squadron RAF commanded by aces Billy Bishop and Mick Mannock. On 18 July 1918 Donovan walked away after crashing his SE 5a while landing during a wind storm. The next day his luck ran out. He departed his aerodrome in the late afternoon and never returned. He was likely shot down and killed. Raymond and Juanita Collishaw in 1935. It is a true testament of the love between Raymond and Neita that their relationship endured. Despite losing three brothers in the air force, Neita remained committed to a man who made the air force his career. 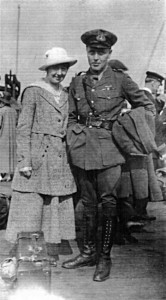 Collishaw recalled that “getting married during the war seemed tantamount to asking a girl if she would like to become a young widow and afterwards I had been on foreign postings where wives were not then allowed.” After a long six-year engagement they were married in England in the summer of 1924 after Collishaw returned from his postings in Iraq. Neita would follow Raymond to numerous postings in England and Egypt until they returned to British Columbia following the end of the Second World War. Along the way they would welcome two daughters, Felicity and Mary. It is worth remembering that loss was felt in many ways and sometimes, maybe rarely, it had a silver lining. From the poem “My Boy Jack,” found in Tonie and Valmai Holt, ‘My Boy Jack?’: The Search for Kipling’s Only Son (London: Leo Cooper, 1998), intro. Russell Miller, Boom: The Life of Viscount Trenchard, Father of the Royal Air Force (London: Weidenfeld & Nicolson, 2016). The question of aerial kills has always been a contentious issue. The British system of verifying claims in the First World War was haphazard at best. It is generally agreed that Major William “Billy” Bishop led Allied aces with 72 kills and that Collishaw was second with 61 kills, tied with Major Edward “Mick” Mannock. For a more complete discussion on this issue, see Christopher Shores, Norman Franks, and Russell Guest, Above the Trenches: A Complete Record of the Fighter Aces and Units of the British Empire Air Forces 1915-1920 (Stoney Creek, ON: Fortress Publications, 1990), 115-6 and Christopher Shores, Norman Franks, and Russell Guest, Above the Trenches: Supplement (London: Grub Street, 1996), 16. Naval Three was the colloquial name given to No.3 Squadron, Royal Naval Air Service. On 1 April 1918 it became No.203 Squadron when the Royal Flying Corps and Royal Naval Air Service were combined to create the Royal Air Force. 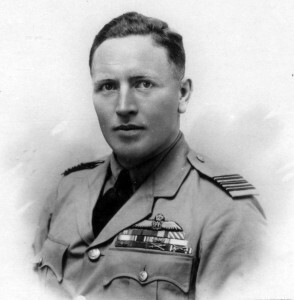 Her son, Lloyd Breadner, was Collishaw’s good friend and a fellow Canadian pilot in the RNAS. Letter, Raymond Collishaw to Mrs. Breadner, 20 April 1921, Air Marshal L.S. Breadner Papers, Folder “B” 1917-1944, 74/707, Directorate of History and Heritage, National Defence Headquarters, Ottawa, 1. Mesopotamia also includes small areas of northeastern Syria, southeastern Turkey and southwestern Iran. The region was entrusted to Britain in 1920 as a result of the Treat of Sèvres and became known as Mandatory Iraq or the Kingdom of Iraq under British Administration. For full details see Peter Sluglett, Britain in Iraq: Contriving King and Country, 1914–1932, 2nd ed. (London: I.B. Tauris & Co. Ltd., 2007). Letter, Raymond Collishaw to Mrs. Breadner, 20 April 1921, Air Marshal L.S. Breadner Papers, Folder “B” 1917-1944, 74/707, Directorate of History and Heritage, National Defence Headquarters, Ottawa, 4. Letter, Raymond Collishaw to Mrs. Breadner, 20 April 1921, Air Marshal L.S. Breadner Papers, Folder “B” 1917-1944, 74/707, Directorate of History and Heritage, National Defence Headquarters, Ottawa, 5. Letter, Raymond Collishaw to Mrs. Breadner, 20 April 1921, Air Marshal L.S. Breadner Papers, Folder “B” 1917-1944, 74/707, Directorate of History and Heritage, National Defence Headquarters, Ottawa, 6. Raymond Collishaw, ‘Notes on Experiences,’ n.d., (ca.1940), Canadian War Museum 19770669-025, 21. Collishaw with Dodds, Air Command: A Fighter Pilot’s Story, 137-8, 178-9. Collishaw with Dodds, Air Command: A Fighter Pilot’s Story, 138. Raymond Collishaw and R.V. Dodds, Air Command: A Fighter Pilot’s Story (London: William Kimber, 1973), 223. For details of the courtship, see Collishaw with Dodds, Air Command: A Fighter Pilot’s Story, 137-8, 178-9, 222-3.